The Venue 11 Pro works as well as any comparable product. It also has a few distinct advantages, including a solidly built chassis and an add-on keyboard that makes it feel much more like a laptop than the Surface does. Most importantly, it has a default full-HD 1,920x1,080-pixel display, which is something very rarely found in a screen this size. However, the same as other tablets, the Dell's Windows 8.1 tablet doesn't comes with a DVD-ROM. So if you want to enjoy your favorite DVD movies on Venue 11 Pro, you'll need to convert DVD to Dell Venue 11 Pro accepted format (e.g. MP4) first. To get the job done, a DVD Ripping tool is essential. You may confused about choosing a suitable tool. If so, I recommend you try EaseFab DVD Ripper. The program is easy to use for ripping and conversion and make great quality copies of DVD files including DVD discs, ISO/IFO image files and DVD folder. With it, you can effortlessly make your DVD videos playable on Dell Venue 11 Pro in just a few mouse clicks. In addition, this DVD Ripper can also rip DVD to AVI, FLV, MKV, MOV, OGG, FLAC, WAV, etc. for playing and sharing anywhere. If you're using a Mac, you can turn to EaseFab DVD Ripper for Mac, which has the same function as the Windows version. Get ready for the conversion? Just download the right version and follow the guide to import DVD movies to Dell Venue 11 Pro with ease. 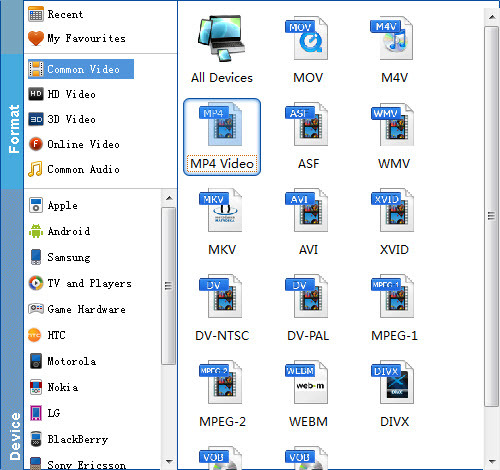 The ways to convert DVD to Dell Venue 11 Pro and Windows (Windows 8/8.1/10 included) are the same. This below guide uses the Windows (Windows 8 included) version screenshots. Just make sure you download the right version. Click on "Profile" and select MP4 from "Common Vidoe" category as the output format. You can click "Settings" to change the video encoder, frame rate, resolution, etc. Remember the file size and video quality is based more on bitrate than resolution which means bitrate higher results in big file size, and lower visible quality loss. According to my experience, for watching movies on Dell Venue 11 Pro, 720p with 1500kbps~2000kbps (depending on the movie length) is just all right. When you are satisfied with all the settings, you can click "Convert" and let the software do the DVD to Dell Venue 11 Pro MP4 conversion. After the ripping, you can click "Open" to locate the converted MP4 video files and just transfer them to your Dell Venue 11 Pro without limitation!